Background and objectives Whether patients with monoclonal protein are at a higher risk for progression of kidney disease is not known. The goal of this study was to measure the association of monoclonal protein with progression to ESKD. Design, setting, participants, & measurements This was a retrospective cohort study of 2,156,317 patients who underwent serum creatinine testing between October 1, 2000 and September 30, 2001 at a Department of Veterans Affairs medical center, among whom 21,898 had paraprotein testing within 1 year before or after cohort entry. Progression to ESKD was measured using linked data from the US Renal Data System. Results Overall, 1,741,707 cohort members had an eGFR≥60 ml/min per 1.73 m2, 283,988 had an eGFR of 45–59 ml/min per 1.73 m2, 103,123 had an eGFR of 30–44 ml/min per 1.73 m2 and 27,499 had an eGFR of 15–29 ml/min per 1.73 m2. The crude incidence of ESKD ranged from 0.7 to 80 per 1000 person-years from the highest to lowest eGFR category. Patients with low versus preserved eGFR were more likely to be tested for monoclonal protein but no more likely to have a positive test result. In adjusted analyses, a positive versus negative test result was associated with a higher risk of ESKD among patients with an eGFR≥60 ml/min per 1.73 m2 (hazard ratio, 1.67; 95% confidence interval, 1.22 to 2.29) and those with an eGFR of 15–29 ml/min per 1.73 m2 (hazard ratio, 1.38; 95% confidence interval, 1.07 to 1.77), but not among those with an eGFR of 30–59 ml/min per 1.73 m2. 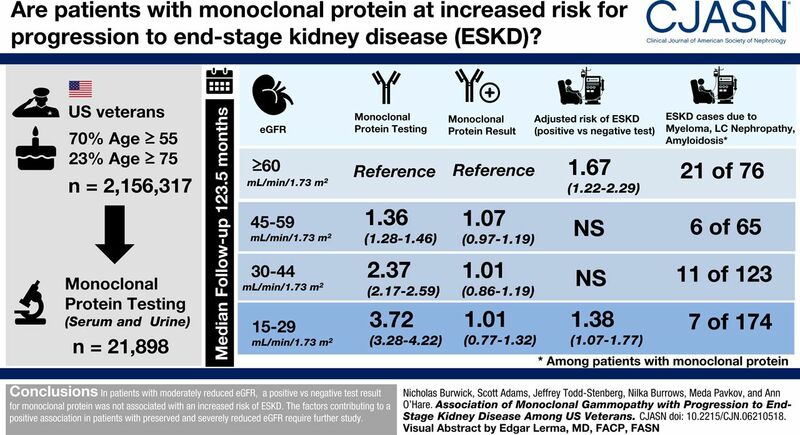 Progression to ESKD was attributed to a monoclonal process in 21 out of 76 versus seven out of 174 patients with monoclonal protein and preserved versus severely reduced eGFR at cohort entry. Conclusions The detection of monoclonal protein provides little information on ESKD risk for most patients with a low eGFR. Further study is required to better understand factors contributing to a positive association of monoclonal protein with ESKD risk in patients with preserved and severely reduced levels of eGFR.